The NFL and the officiating department have struck again, this time hitting pass rushing sensation T.J. Watt with a hefty fine for a hit he laid on Atlanta Falcons quarterback Matt Ryan. The hit came last week by the young ​Pittsburgh Steeler, who is being fined for "forcibly hitting in the knee area or below” against Ryan. In addition to many fans across the league, Watt's older brother J.J. had a pretty skeptical reaction to the fine. Like all of us, he thinks it's a joke. Yeah, it is pretty ridiculous. Roughing the passer calls and their eventual fines have been dominating headlines in the NFL, which is pretty sad considering the star power of the league. 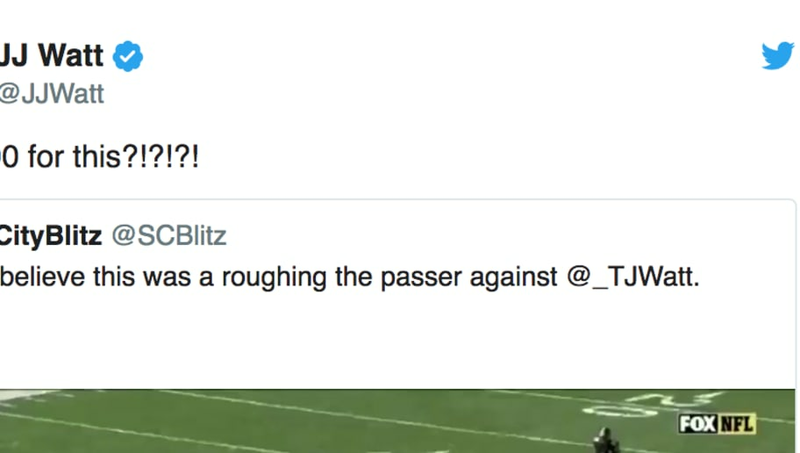 T.J. Watt appears to be the latest victim of the ridiculous officiating this year, and the Watt family as a whole is not happy. Watt is currently co-leading the league in sacks with six in five games. While the league has robbed the young star of $20,000, something tells us that the pass rusher won't be slowing down soon. Still, the NFL has given plenty of defenders second thoughts about making any kind of contact with the quarterback. The roughing the passer penalties need to be reformed for next season, and hopefully, something more sensible can be done this season to eliminate some of these embarrassing calls.